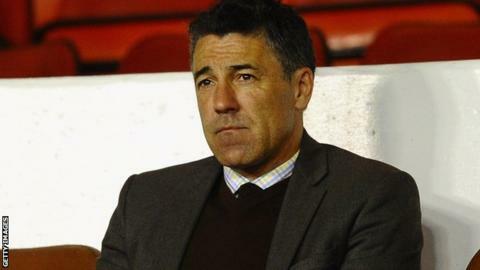 Crawley Town interim manager Dean Saunders wants the board's support in the January transfer window after joining the struggling League One club. The 50-year-old was placed in charge on Saturday after John Gregory stood down to undergo heart surgery. The Reds are on a run of nine league games without a win and are only above the relegation zone on goal difference. "I said to the board if you give me the tools to make a difference then I will [come in]" Saunders told BBC Surrey. "They have assured me I can do something that will make us better. "I've got two weeks to get some players into the building, because we are obviously short and I didn't realise. "We hardly had enough players to put on the bench against Colchester and I didn't know some of their names." Crawley chief executive Michael Dunford described Saunders as "very energetic, enthusiastic and knowledgeable" and said the former Wales, Liverpool and Aston Villa striker "will be allowed to put his own footprint on the team". Saunders knows his main priority is to help the West Sussex side avoid relegation to League Two, but insisted there was no reason for anyone to feel downcast. "I told the players I don't have to put myself in this position, coming into a club in a relegation battle," the former Wrexham, Doncaster and Wolves boss said. "I've been in three clubs that were sliding the wrong way for a number of years before I got there. This club has been winning (before the current run) and there is no rot that has set in. "If you look back at Crawley's history in 50 years' time, this will be one of the highlights. In the big picture, this is as high as the club have ever been." Gregory departs Crawley after just over a year in charge, while Saunders returns to management for the first time since his departure from Wolves in summer 2013. "It happened very quickly," Saunders said. "I was asked to do the job by Michael Dunford, I knew John was ill and it's difficult and strange circumstances really. "I had a think about it and then John rang me himself and asked me 'would I help?'. "Knowing Michael Dunford and John Gregory made me put my neck on the line. I'm going to try and enjoy it and do the best I can."